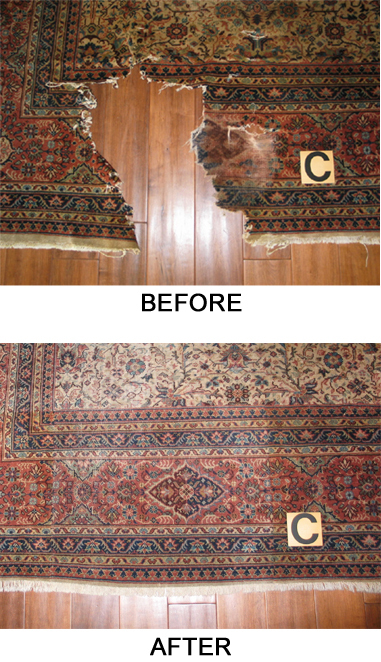 Since 1980 Sherman Oaks’s Persian rug repair need have been served by Antique Rug Company’s award winning rug repair workshop. Pick up and delivery is available for all San Fernando Valley areas including for Sherman Oaks zip codes 91403, 91411, 91413 and 91423. Or customers can bring their rugs for in-person inspection and advice. Your handmade rugs are valuable works of art. Antique, vintage, collectible, family heirloom or new, all rugs should be cared for as they are used. We suggest following the maintenance recommendations at our RUG CARE section to keep your rugs safe and in good condition. 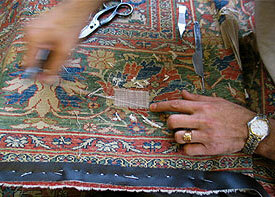 And if accidents happen and a rug is damaged, it is advisable to have repair advice timely and avoid further loss. 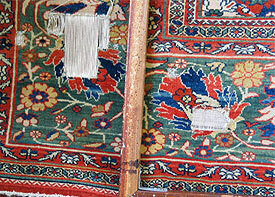 Our knowledgeable rug restorers will inspect your rug and advise you on the best options for repair or restoration. 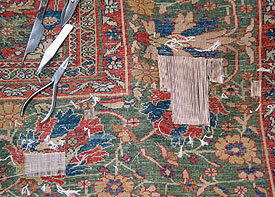 There is no rug repair too small or too large for the workshop. And in the past we have repaired all types of handmade and machine made area rugs — Oriental, Persian, Navajo, mechanical and other. At the end of this page you can view Before and After images for samples of our completed repairs.